Biophysical techniques, which overcome many of the problems associated with the use of biochemical methods, have recently been used to pro vide strong evidence for the existence of GPCR oligomerization in intact cells (reviewed in refs. 2,3,5,54, and 55) (Table 1). 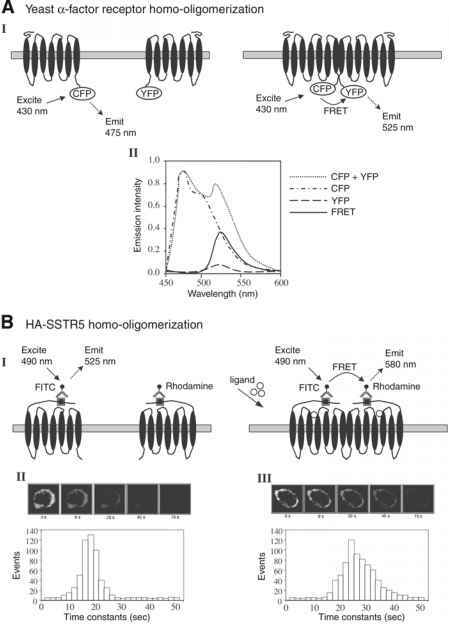 Fluorescence resonance energy transfer (FRET) and the newly emerging derivative, bioluminescence resonance energy transfer (BRET), have the distinct advantage of being able to monitor receptor-receptor interactions in live cells in real time. FRET is a strictly distance-dependent energy transfer technique that has been used for several years to detect and monitor protein-protein interactions in live cells, both temporally and spatially. It involves the transfer of energy from a fluorescent energy donor, following its excitation, to a fluorescent energy acceptor when in close enough proximity (<100 Â). Measuring this transfer of energy relies on a sufficient overlap between the emission spectrum of the donor and the excitation spectrum of the acceptor to allow energy transfer. Ideally, there should be little overlap between the excitation spectra of the donor and acceptor molecules to minimize the degree of direct excitation of the acceptor fluorophore as well as sufficient separation between the emission spectra of the donor and acceptor molecules to allow measurement of acceptor fluorescence without contaminating bleedthrough from donor fluorescence. The fluorescent donor and acceptor molecules can be either fluorescent proteins genetically added to the proteins of interest to produce fusion proteins or fluorescent dyes, which are used to label the proteins in combination with receptor- or epitope-specific antibodies. Green fluorescent protein (GFP) and its color variants have a wide range of spectral properties and thus have been used as FRET pairs to detect many GPCR oligomers. Cyan fluorescent protein (CFP) and yellow fluorescent protein (YFP), have been commonly used as donor and acceptor fluorescent molecules, respectively, to detect GPCR interactions using FRET. The homo-oligomerization of the D2 dopamine receptors (56), the yeast a-factor receptor (Ste2)(57), the neuropeptide Y receptors (Y1, Y2, and Y5), (58) and the complement C5A receptors (59) all have been demonstrated using CFP and YFP receptor fusion in FRET-based assays (Fig. 1A). Additionally, CFP and GFP (60), GFP and red fluorescent protein (RFP) (58,61), and YFP and RFP (62) have been used as donor and acceptor pairs in FRET. gously expressed 5-opioid receptors (63), D2 dopamine receptors (64), and SSTR5 (65) as well as hetero-oligomerization of SSTR5 and D2 dopamine receptor (66) (Fig. 1B). Using fluorescent dyes conjugated to receptor-specific antibodies, it should be possible to detect FRET between endogenous receptors and image these interactions in a single cell, as has been done for other membrane receptors, including the epidermal growth factor receptor (67). An increase in the availability of receptor-specific antibodies for GPCRs would make it more feasible to monitor endogenous receptor-receptor interactions, thus providing strong evidence for the existence of GPCR oligomers in vivo. The simplest FRET-based approaches to monitor GPCR oligomers involve measuring the ratio of acceptor versus donor emission (or intensity). As a result of FRET, donor emission decreases and acceptor emission increases, and the acceptor/donor fluorescence intensity ratio in a cell co-expressing both fusion proteins increases compared to the ratio obtained from cells expressing only the donor-tagged protein. The homo-oligomer-ization of the yeast a-factor receptor (Fig. 1A) (57,68) and the complement C5A receptor (59) as well as the hetero-oligomerization of the a1a- and a1b-ARs (60) have all been demonstrated by employing scanning spectrofluo-rometry on cell suspensions to measure donor and acceptor emissions to detect FRET. Alternatively, donor and acceptor emissions have been measured and FRET has been imaged in single cells for the TSH receptor (62,69) and neuropeptide Y homodimers (58). Ratiometric, intensity-based FRET approaches are at a disadvantage because they require a donor that only expresses cell samples with expression levels similar to those in the donor-plus-acceptor cell population. Furthermore, in a typical FRET experiment, the emitted fluorescent light is a combination of donor emission, acceptor emission caused by direct excitation, and acceptor emission caused by FRET. Therefore, to calculate the FRET efficiency, the proportion of emission resulting from contaminating fluorescence from the donor and direct excitation of the acceptor fluorophore must be accounted for (Fig. 1A). Often, this correction can result in a very low actual increase in acceptor emission, making this FRET-based technique relatively insensitive for detecting weak or low-level protein interactions. Fig. l ground fluorescence has decayed. Donor fluorophore europium3+ has been used with acceptor fluorophore allophycocyanin to detect 5-opioid receptor (63) and D2 dopamine receptor (64) homo-oligomers. gomerization between the D2 dopamine receptor and SSTR5 (66) were demonstrated using pbFRET. Although pbFRET is a powerful way to monitor GPCR oligomerization, its use may be limited by the low availability of the instrumentation and technology required to perform the single-cell FRET microscopy. BRET involves the distance-dependent transfer of energy between a bioluminescent energy donor and a fluorescent acceptor molecule. It is a naturally occurring phenomenon observed in Renilla reniformis, with energy resulting from the degradation of coelenterazine by Renilla luciferase (Rluc) transferred to GFP (70). Similarly, BRET is observed between aequorin and GFP in the jellyfish Aequora victoria. By generating fusion proteins with either Rluc or Aequora GFP or its derivatives, BRET can be used to monitor protein-protein interactions in live cells (70). Performing a BRET assay initially involves genetically fusing one protein with the Rluc and fusing the second protein to the red shifted variant of GFP, enhanced YFP (EYFP). Following the addition of the cell-permeable substrate coelenterazine to cells co-expressing the fusion proteins, energy is transferred from Rluc (peak emission: 480 nm) to EYFP if the proteins are in close enough proximity (<100 Â). Energy is then re-emitted at a wavelength characteristic of EYFP (peak emission: 530 nm) (Fig. 2A). Similarly to FRET, BRET involves a ratiometric measurement (BRET ratio = the ratio of light emitted at 530 nm over that emitted at 480 nm). The extent of BRET is then determined by subtracting the BRET ratio for cells expressing only the Rluc-fused protein from the BRET ratio for cells co-expressing both fusion proteins; an increase in the BRET ratio is indicative of an interaction. BRET was first developed to enable the dimerization of the light-sensitive circadian clock protein KaiB from cyanobacteria to be studied (70). 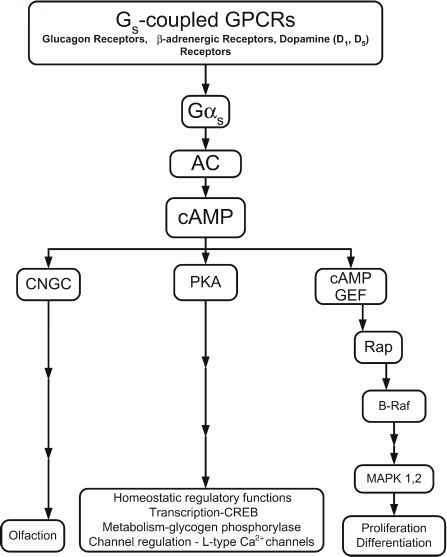 It has now been used to demonstrate the oligomerization of many GPCRs in living cells (Table 1), including the homo-oligomerization of the P2-AR (11), TRHR1 (71), GnRH receptor (71), and type A cholecystokinin (CCKA) receptor (72) as well as hetero-oligomerization between the type 1 and 2 TRHRs (73), oxytocin and V1 or V2 vasopressin receptors (74), adenosine A2A and D2 dopamine receptors (75), and CCKA and CCKB receptors (76). Fig. 2. Schematic diagram illustrating the application of BRET and BRET2 for the detection of GPCR oligomers. (A) Receptors C-terminally tagged with either the energy donor, Renilla luciferase (Rluc) or the energy acceptor, EYFP are co-expressed in cells. In the absence of dimerization or oligomerization, no energy transfer is observed following addition of the cell permeable Rluc substrate, coelenterazine (h form), and light is emitted from Rluc at a peak wavelength of 480 nm. If an interaction occurs, then the tags are in close enough proximity (<100 Â), allowing energy transfer from Rluc to EYFP and additional emission of fluorescent light at a peak wavelength of 530 nm. (B) In BRET2, energy is emitted from the donor, Rluc, at a peak of 410 nm, as a result of degradation of its substrate DeepBlueC. It is then transferred to the acceptor, GFP, leading to the appearance of an emission peak at 515 nm characteristic of the GFP used. BRET2 provides an advantage over the original BRET system, with greater spectral resolution (105 nm) between donor and acceptor emissions. sensing receptor (79), and neuropeptide Y Y4 receptor (80) as well as hetero-oligomerization between the adenosine A2A and D2 dopamine receptors (81) and adenosine A1 and P2Y1 receptors (50). BRET has also been applied quantitatively to gain insight into the relative affinities of various homo-oligomers and hetero-oligomers (82). BRET saturation curves can be generated by expressing an increasing concentration of acceptor fusion protein with a constant amount of donor fusion protein. The BRET signal should rise with increasing concentration of acceptor fusion protein until a maximum signal is reached, with the maximum signal being a function of the relative orientation and distance between the donor and acceptor tags and the quantity of dimerized receptors. However, the concentration of acceptor fusion producing 50% of the maximum BRET signal (BRET50) is a measure of the relative affinity of the interaction. This approach was used to show that the P1- and P2-ARs formed homodimers and heterodimers with similar relative affinities, suggesting that homo-dimers and hetero-dimers co-expressed at equivalent levels should form in equal proportions (82). The V1a, V2, and oxytocin vasopressin receptors were also demonstrated to have a similar propensity to interact with themselves as they were to each other (74). This may suggest that in vivo, the degree of homo- versus hetero-oligomer-ization may be determined by the relative expression levels of the receptors rather than by interaction affinities. Alternatively, accessory proteins may be involved in modulating homo- and hetero-oligomer formation.